The following is a half-way survey on my progress towards meeting our charter goals for the school. I feel pretty proud that I am on track at meeting these goals. Does it make me a better teacher? I don't know some days... I think about about when I first started teaching. You come out of Uni thinking "Yeah, I can do this". However, teaching and learning only takes up a certain amount of an educators time; behaviour management, assessment, portfolios, eportfolios, elearning, productions, school assemblies, school discos, staff meetings, team meetings... The list goes on and on. So you just get swept away in the river of school. 3 years later, I Have a bit more experience at RSS, it's kind of like learning to kayak. 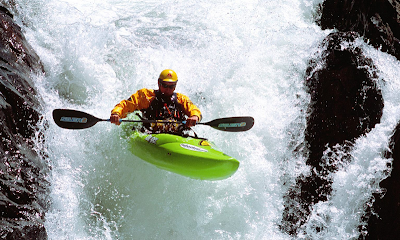 To a novice, the velocity of the current sends you down the river of school, full of rapids and turbulent whitewater, it thrusts you around like a rag doll. But as a practitioner, you learn to use your paddle correctly and adjust with the current; you learn to recognise the lines and angles of the river and change your stroke. You predict what is coming around the corner so you can position your body, paddle and mind to slide through with ease.